The inaugural issue of the Williams Journal of Foreign Affairs came out just before finals in the spring. Student contributors wrote pieces that delve into topics we might read about in the newspapers—such as China’s support for the Paris Agreement and the role of the U.N. in the Israeli-Palestinian conflict. They also contributed stories we see less often in the headlines, such as the international response to the crisis in Burundi, by Hayley Elszasz ’16, and the U.S. military’s need to focus on protecting cyberspace, by editor Henry Lu ’19. The journal is intended to appeal to a wide audience, from students who have never taken a course in international relations, political science, or economics to those who consider themselves foreign policy buffs. “We opened it up to the entire student body to contribute, and it’s meant for all readers,” says editor and recent Williams graduate Katie Shao ’16. “The goal isn’t to educate people on certain foreign policy topics, but to pique their interest in foreign affairs more broadly,” says Lu. The journal is funded by the Stanley Kaplan Program in American Foreign Policy, which is based in Williams’ leadership studies program. The journal is the newest element of the Kaplan Program, which has supported the Williams Summer Institute in American Foreign Policy since 2010, hosting an ongoing speaker series, and bringing in distinguished visiting professors in both political science and history every year. The board of editors is excited to put out another edition of the Williams Journal of Foreign Affairs next semester, and they plan to make it a regular feature going forward. 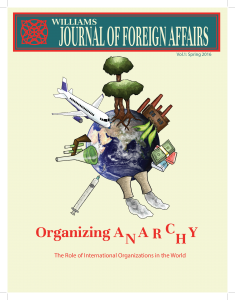 Each semester the journal will address a different theme or aspect of foreign affairs. Contributions from students across disciplines are encouraged—keep an eye out for a call for submissions in Daily Messages early next fall—and the editors hope to include faculty contributions going forward.